To do this I created a few databases with a set number of fields and various numbers of records. 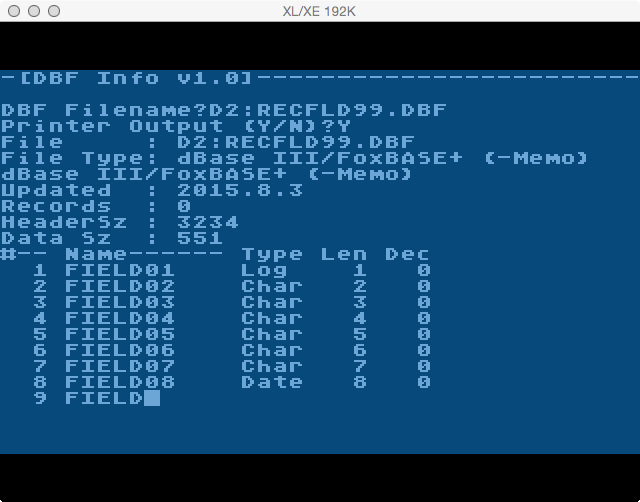 I then used documentation for the dBase III file format, a hex editor, and careful scrutiny of the byte streams to decipher the files. The documented format I found may have been correct, but it didn’t completely match the test files I created. I’ve lost the link to the page I got it from and subsequent searches have yielded what appear to be fairly accurate mappings. Maybe the original link was for a different dBase version. At any rate, it was only a few bytes off in a couple of places and only took careful examination to resolve. I’m not going to cover the structure definition in this post, but I will include the links I do have at the conclusion. 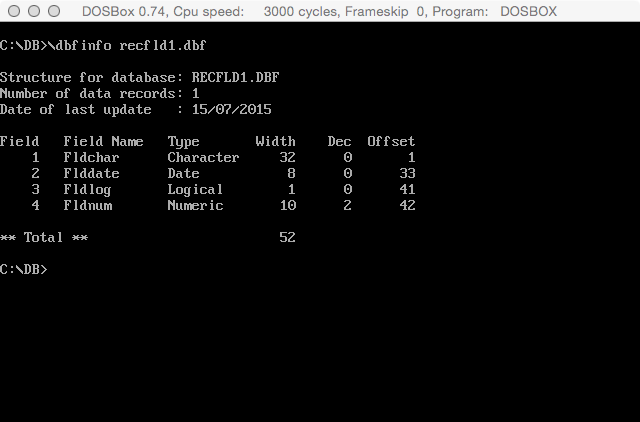 With an accurate file mapping, I started writing code to read a file. The program here is the result. This program includes a little bit of everything I’ve covered in the past Action! posts. While the code is fully documented, I am going to break it down in this post. This time the breakdown will follow the complete source – I think that makes more sense than having it before like I have done before. And since this uses several files via INCLUDE, those are listed as well (but not broken down because their contents have previously been broken down in posts). In addition to code I wrote it uses two code libraries from the Action! Toolkit: PRINTF.ACT and CHARTEST.ACT. The source code INCLUDEs them from D5. Alter the drive for the drive you have the Action! Toolkit loaded into. It also uses the Action! runtime library. I copied the runtime library SYS.ACT to the same drive (D2) as the program source. I did this because it requires a modification. For a successful compile the PRINTF routine has to be commented out of the runtime (SYS.ACT) because it conflicts with the PRINTF from the toolkit. 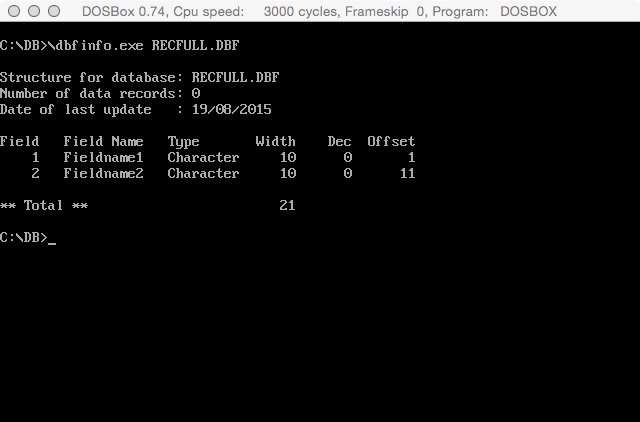 Normally I have the runtime in disk 4 (D4), but here you see it included from disk 2 (D2). The code I’ve written is released under the Creative Commons Attribution-NonCommercial-NoDerivatives 4.0 International license. Some may disagree with the license I’ve chosen. The choice is temporary until I complete the remaining components. When I feel I am finished I will alter the license to be more open. ; Requires DEFINES.ACT be loaded 1st! This sections saves the original error vector and assigns it to the custom one. It then sets up the screen for output. I used plain ASCII for all these blog posts because ATASCII doesn’t display properly. 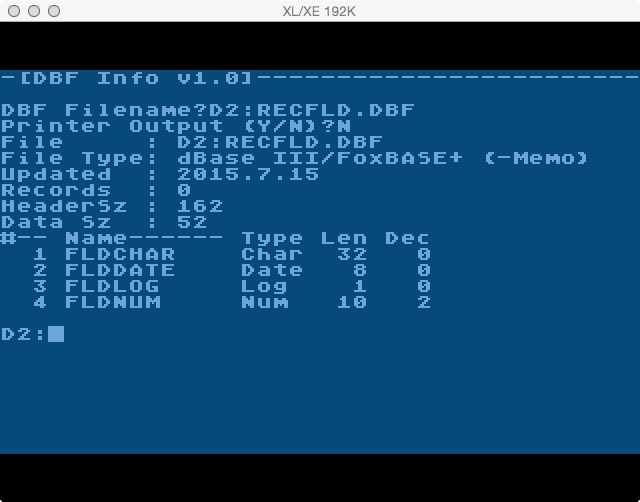 I ran a PC DOS based version of a similar program as a validation against each of the files. 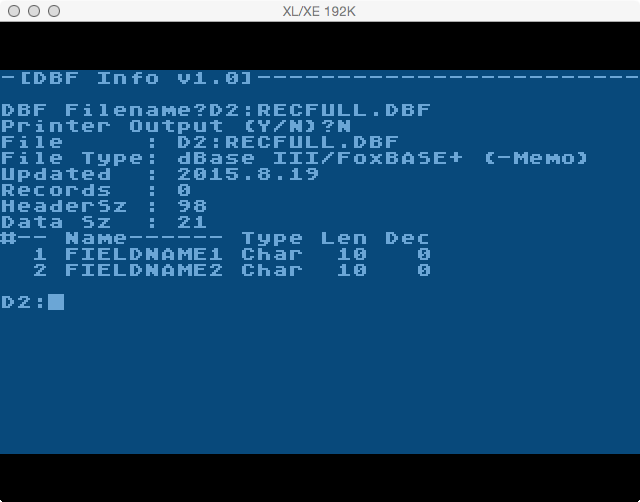 I’ll present screenshots of both the PC DOS and my Action! version against each file. I’ve included an ATR image as well. It has the program source, the libraries, the compiled program, and sample databases. Download the ATR. Remove the “.key” from it and add “.ATR”. It is not a Keynote file! ATR and zip are not allowed hosting types here so I added “.key” to it. 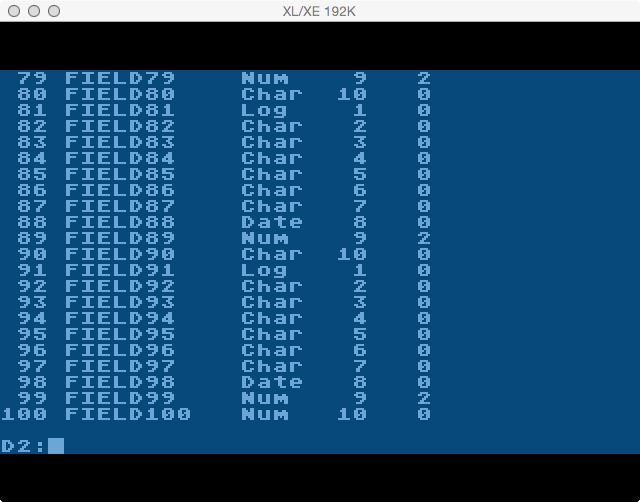 And finally there is this thread on AtariAge forums talking about dBase for Atari. Looks like dBase II was released for the Atari ST only.